I am glad to post my first song after moving to Chennai nearly after more than a month, as it took little time in settling down. By the Grace of Mahaperiyava and Lord Muruga I am glad to present the Deekshitar Kriti “Swaminatha Paripaalayasumam” set in Raga Naata. 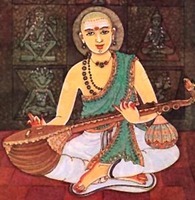 This is song is believed to have been composed on the Lord Swaminatha of Swami Malai, one of the Six Abodes of Skanda (Arupadai Veedu). I last visited the Uttara Swami Malai at New Delhi, may be due to that I presume the Lord had showered his grace to post this song today on the Dakshina Swami Malai. Have shred the lyrics with meaning along with audio link sung by legendry Sri GN Balasubramanian (GNB). May the Lord Swaminatha shower his blessings on All. O Swaaminaatha, please protect me without any delay. The self-effulgent Lord of Valli and Devasena. The one who is adored by Lord Vishnu (father of Kaama) , Lord Brahma (husband of Bharati [Saraswati]). Fostered by Kritikaa ladies, adored by Narada and other sages. Son of Lord Shiva and Goddess Parvathi. Whose divine form attracts even Manmatha. His divine holy feet is capable of bestowing the gift of weath and boon as desired by devotees. He nurtures the three arts of poetry, literature and drama. The one who brighten the five basic elements Earth, Water, Fire, Air and Sky. He is the form of knowledge and who bestows eternal joy (ananda) to his devotees.